Academia finally joins the conversation about TURN! 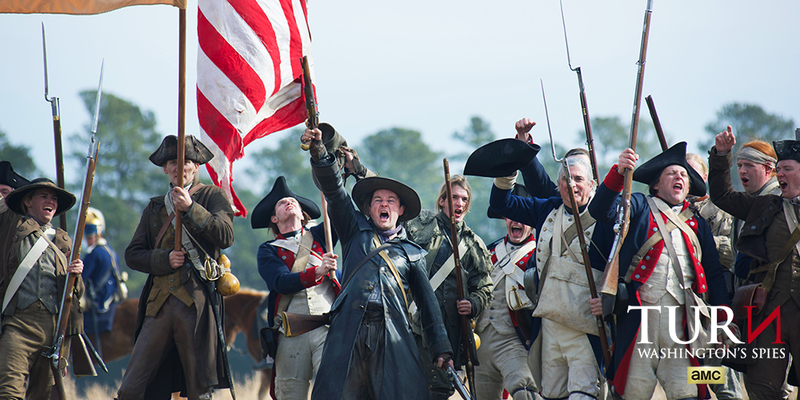 The newest issue of Common-place, an online scholarly journal of Early American life and culture, just launched yesterday — and it features a Roundtable discussion about historical accuracy in TV and film, using TURN: Washington’s Spies as a case study. Don’t let the “scholarly journal” part scare you off — the two main articles in this Roundtable are spirited and highly-readable commentary pieces that are must-reads for any serious fan — or critic — of TURN. The newest issue of Common-place, Issue 15:3.5, features a Roundtable discussion on TURN: Washington’s Spies. Back in February of this year, we mentioned a most unlikely meeting of the minds at the College of William & Mary, where TURN producers, writers, and cast members gathered onstage alongside William & Mary professors to discuss the role and importance of historical accuracy in film. Happily, footage of the entire 90 minute event was released on Youtube in May, with shorter highlights posted in a William & Mary press release (in case you don’t have an hour and a half to spare). Do the virtues of inaccurate historical films outweigh their vices? How much weight should accuracy have in our evaluation of historical film? Most importantly, are there historical narrative truths that supersede factual accuracy? 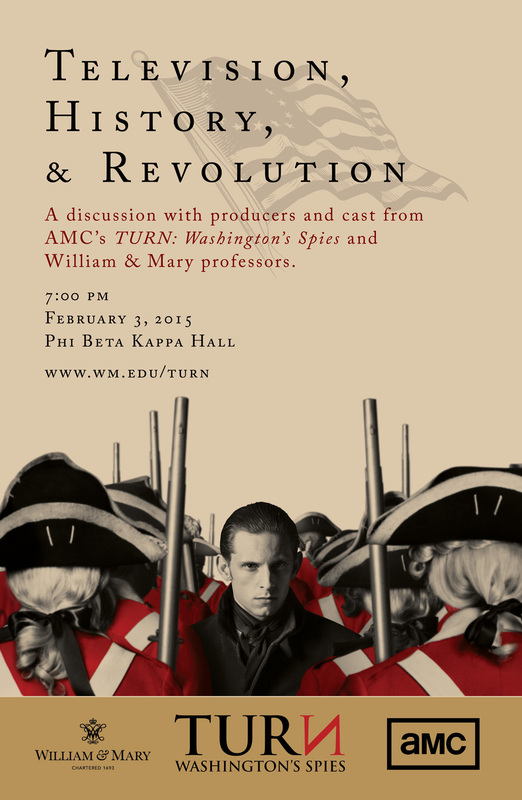 The original poster for William & Mary’s “Television, History, & Revolution” event. Click to enlarge. Jeremy Stoddard, a professor of education and film studies, gives TV and film writers the benefit of the doubt, arguing that fictional historical narratives DO have value (that is, beyond the monetary sort), referencing his own quest to learn more about Robert Rogers after watching the TURN series premiere. Stoddard, who attended the William & Mary event in person, gives readers a thoroughly detailed summary of the arguments given by TURN’s writers, producers, and other staff (e.g. the costumer) for why they deviated from the historical record in the way that they did. Read Jeremy Stoddard’s Roundtable article here. On the other end of the debate, T. Cole Jones explains why he finds TURN’s blatant disregard for historical fact extremely problematic. Longtime readers of this blog are already familiar with Dr. Jones, who penned an excellent piece analyzing the treatment of prisoners of war in Season 1 of TURN. In his article for Common-place, Jones targets the show’s portrayal of John Graves Simcoe as a murderous sociopath and cartoonish British villain. He doesn’t mince words, arguing that TURN’s “artistic liberties” are so factually untrue they’d “undoubtedly expose the producers to a defamation of character suit were the people portrayed in the series still alive.” According to Jones, a number of TURN’s factual problems can be traced back to the show’s alleged source material: Alexander Rose’s book Washington’s Spies. It’s a solemn reminder that not all history books are created equal. (We’ll be offering our own concurring opinion on this point sometime later in the TURN offseason.) Read Cole Jones’ Roundtable article here. Like I said, these pieces are must-reads for any serious fan or critic of TURN — or of historical fiction in general. If you have a Disqus account, you can leave comments on the articles themselves, or join the conversation on Twitter. Finally: It’s incredibly refreshing to see academics engaging this issue in a scholarly forum — and my thanks to the event organizers at William & Mary for providing an excellent icebreaker back in February. Far too many scholars of Early America have asked the same question voiced by certain TURN fans upon finding this blog: So what? Who cares if some TV show is historically accurate or not? Over the past two years, I’ve been stunned — though not entirely surprised — at how many academics have plugged their ears to the debates taking place over historical accuracy in TURN, often dismissing the subject as insufficiently intellectual or otherwise not worth their attention. They couldn’t be more wrong. Granted, the primary purpose of TV shows is to entertain, not educate. (And make money doing it.) However, as I argue in the introduction I authored for the Roundtable, the question of accuracy in film does matter because, for better or for worse, historical fiction influences popular historical memory. These TV shows and films are affecting how Americans remember their own history. And for that reason, among others, scholars of Early America ought to weigh in on these debates — which, in many cases, are already happening all around them. As we’re seeing with a number of recent events (e.g. the Confederate Flag brouhaha), the intersection of history and memory impacts an awful lot of people. We do the American public a grave disservice if we let the same people who write questionable “history” books — and the shows and films based on them — be the loudest voices in the conversation. This entry was posted in TURN news and tagged academia, academic historians, alexander rose, amc turn, cole jones, common-place, education professors, film studies, historical accuracy, historical fiction, hollywood history, jeremy stoddard, John Graves Simcoe, narrative history, public historians, rachel l smith, robert rogers, roundtable, t cole jones, TURN, turn amc, TURN: Washington's Spies, washington's spies, william & mary.